Gordon-Keeble 50th Anniversary from Eastleigh News on Vimeo. A fleet of rare Gordon-Keeble Cars returned to their ‘birthplace’ to celebrate 50 years since production of the car started in 1964. Built at Southampton Airport, in the building also famous for the production of the early Spitfire aircraft, the cars were manufactured there until 1966. 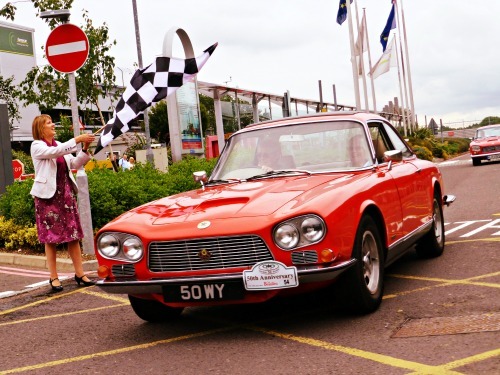 A Gordon-Keeble procession began at Southampton Airport yesterday marking the start of the cars’ return to their home area, a celebration spanning from 27th – 29th June. 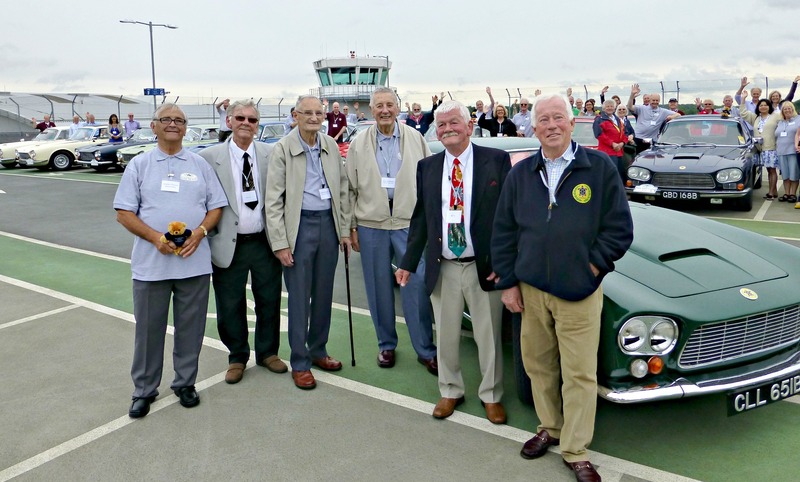 Forty-nine cars from around the world assembled in chassis order on the top floor of the airport’s car park – the building on the site of the previous factory – and drove in formation through Spitfire Loop in front of the airport’s terminal. The cars continue their celebrations by visiting Beaulieu, Southampton Civic Centre, Winchester and Eastleigh High Street. They will even re-visit the fabled Jim Keeble test route where Jim personally tested each car at 140mph. The cars, produced by John Gordon and Jim Keeble harnassed the power of a American muscle car in a light weight bodyshell made from the same stuff as a Robin Reliant – glass fibre. Hardly surprising then, that it was one of the fastest production cars on British roads – contrary to what you might expect from it’s badge which featured a tortoise. Only an E-type was quicker from 0-60 but the Gordon-Keeble had the advantage of four usable seats. A 300 Bhp 5.4 litre V8 engine from a Corvette fed by a multi-choke carb sat on a chassis evolved from another classic British marque – Peerless – while the body was styled in Turin by Carozzeria Bertone’s chief designer Giugiaro who went on to design another classic British sports car – the original Lotus Espirit. Giugiaro’s styling took design cues from his work on the Alfa Sprint and the Ferrari 250 giving the Gordon-Keeble a truly continental look reinforcing its image as an ‘International Tourer’. Twin petrol tanks gave it 400 mile range and disc brakes all round made sure you could stop when you got there. The interior has a dashboard full of dials and long throw switches while an abundance of quilted upholstery and the smell of wood and leather adds to the kind of sensory overload you can only experience when sat behind the wheel of a classic British sports car. Although Gordon-Keeble had intended to produce around 200 vehicles a year the company was in trouble almost as soon as production started. Not only was the selling price of £2,800 the same as the average price of a house, but problems in the supply chain meant it was impossible to maintain production and generate steady cash flow. “There were lots of strikes at suppliers of component parts and engines so supply dried up. We couldn’t keep production going, it was a shame really. “We were very honoured to welcome these rare Gordon-Keeble cars back to Southampton Airport, the place where it all began. Surely this is Eastleigh Airport, or has that been conveniently airbrushed from history? The airport is entirely within Eastleigh but, as is the convention worldwide, it is named after the nearest major city which it serves. Glasgow airport is at Prestwick, Rome is at Fiumincino Venice Marco Polo Airport is miles away from Venice and so on. I fully support the Monster Raving Loony Party 2013 by-election manifesto pledge to rename Southampton Airport after Benny Hill but I’m afraid Ed Milliband wasn’t too taken with the idea when I asked him about it!